When it comes to first impressions, the Jungle Navigation Co. Ltd. Skipper Canteen does not disappoint. From the porch vignettes, the outdoor seating area and entrance, to whichever room you happening to be dining it, the table is meticulously set. What you order first says a lot about how your meal is going to go, so you’d best make a great first impression yourself and try one of the specialty beverages. Our first order of business is to hydrate as we begin our three month tour, or one week, whichever one comes first. Unfortunately, the souvenir mugs are not currently in stock, so you’ll have to excuse the photos of plain glasses. I know, we were disappointed to that we had to use clear glasses, but let’s not sink our boat just yet! Let’s go ahead and start with an exploration of the menu descriptions. The two beverages in question are the Punch Line Punch and Schweitzer Slush. 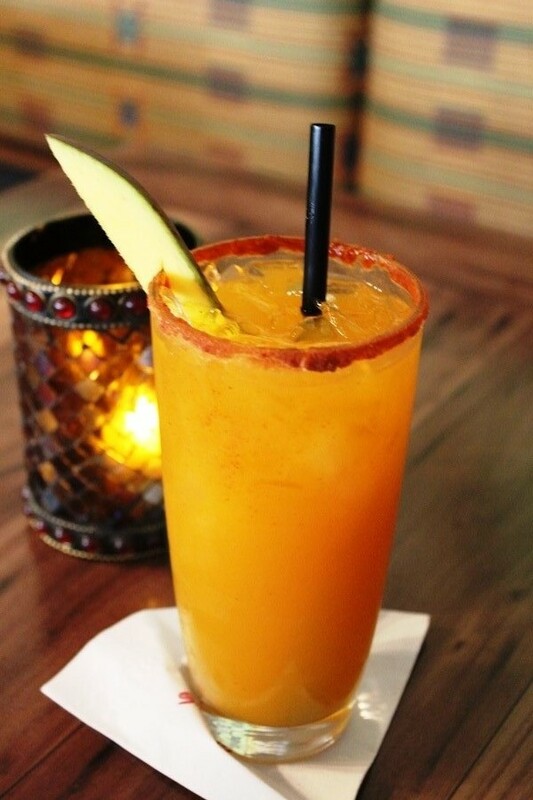 The Punch Line Punch is a concoction of tropical fruit juices combined with mango puree and garnished with a slice of fruit, typically a mango. It can also be served with a savory spiced-rim to pack an extra punch for the punch. Meanwhile the Schweitzer Slush is a blend of frozen apple juice and passion fruit that is topped with Bursting Green Apple Boba Balls. It is said that the slush was conceived by Dr. Albert Slush, the noted explorer and humanitarian. The Punch Line Punch is so sweet that it’ll make you pucker. Not that that is bad thing when you’re swallowing some of the sippers’ punchlines! Thankfully, the heat of the spiced-rim, which seems to include powdered chilies, is the perfect thing to cut some of that sweetness. We tried it both ways and definitely prefer the inclusion of the rim in our order. The mango shines through the other tropical juices to become the major player of the specialty beverage. Regardless of whether you order it with or without the rim, the Punch Line Punch will definitely deliver. Meanwhile, Dr. Slush’s elixir is just plain fun to look at! The frozen apple juice and passion fruit are a good combo and reminds me a bit of LeFou’s Brew from Gaston’s Tavern. Instead of the sweet pucker of the Punch Line Punch, the Schweitzer Slush brings the tartness of green apple bursting in your mouth. Notice the larger straw? 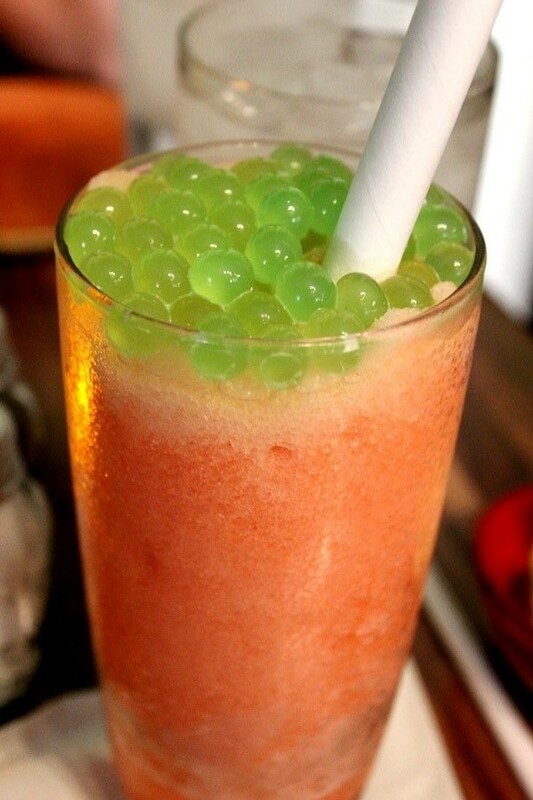 You won’t be digging around for the Boba Balls, they’ll be coming straight at you. The sour apple flavors play well with the fruit flavors in the slush. Children will have a blast with this drink and adults will remember how much fun it is to play with their food! What you order at Jungle Navigation Co. Ltd. Skipper Canteen says a lot about how engaged you’re willing to get in the story, or how willing you are to have a little fun. There are your typical boring beverages and even a pair of exotic Coca-Cola offerings, currently Thailand’s Fanta Melon Frosty and Brazil’s Guarana Kuat (both of which are delicious and intriguing in their own right). No one would blame you if you floated down river with any of these choices, but the truly brave imbibers will happily throw themselves into a Punch Line Punch or a Schweitzer Slush. You truly can’t go wrong with either!